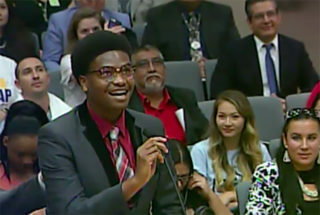 Tyler Okeke will serve as LAUSD’s student board member for the 2018-19 school year. As LA Unified board members thanked Benjamin Holtzman for his service this school year as Student Board Member, Holtzman introduced his replacement: Tyler Okeke. Here are a few things to know about Tyler, who starts his new post in August. High school: Harbor Teacher Preparation Academy, which at Tuesday’s board meeting was renamed after one of the seven board members, to Dr. Richard A. Vladovic Harbor Teacher Preparation Academy. Interests and clubs: Tyler is a rising senior, a debater on the Los Angeles Metropolitan Debate League, president of his school’s Black Student Union, a member of the Los Angeles Mayor’s Youth Council, and founder of the Harbor Political Action Committee.